Someone is getting fired in Anaheim very soon. Now that Angels nightmare season is essentially over, details are emerging about how bad things are in Anaheim. Success in any organization starts at the top, and the rift at the top of the Halos organization seems about as wide as the Grand Canyon at the moment. Fox Sports ‘ John Morosi is reporting that there are “philosophical differences” between Angels GM Jerry Dipoto, and skipper Mike Scioscia, and that retaining both of them is “not tenable”. This would explain owner Arte Moreno’s refusal to comment this week on the futures of both men with his ball club. 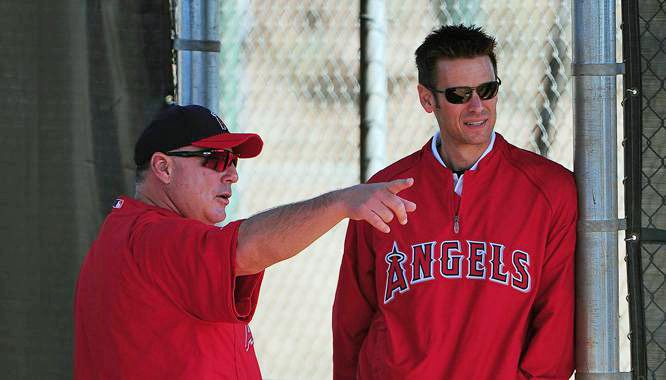 It’s also clear that this rift dates well back to last season, when the LA Times reported that Scioscia disagreed with Dipoto’s firing of hitting coach Mickey Hatcher. A few months later, Fox Sports’ Ken Rosenthal reported Scioscia disliked Dipoto’s staff reliance on statistical data. As I’ve been saying for months now, this rift has been a huge part of the Angels failures on the field. Jerry Dipoto has constructed a ball club that does not fit Mike Scioscia’s style of baseball (doesn’t this sound familiar Laker fans?). Mike Scioscia’s teams have been built on pitching, defense, small ball, and aggressive base running. Instead, Dipoto has crapped all over Scioscia’s style by torturing numbers, which somehow told him guys like Joe Blanton, Tommy Hansen, and Ryan Madsen will be great pitchers. Arte Moreno has also screwed up Scioscia ball by impulsively demanding his GM sign aging sluggers Albert Pujols and Josh Hamilton. More on Moreno’s screw ups in a moment….. If the Angels fire Mike Scioscia, they will have to eat the remaining 5 years on his contract, which includes a total of $12 million in 2017 and 2018. Moreno would probably look foolish for firing Scioscia too, because he would be unemployed for about 5 minutes with his hometown Phillies, and possibly even the Dodgers lining up for his services. This might off-set the cost of firing him slightly, however, Dipoto is only signed through 2014. One the other hand, removing Scioscia might allow Moreno to hire a much cheaper skipper. As for Moreno, this mess starts with him. Scott Miller of CBS Sports is reporting that in January of 2011, the Angels owner demanded that then general manager Tony Reagins trade for Toronto slugger Vernon Wells in 24 hours, or be fired. Moreno’s anger was triggered when the Angels were unable to sign Carl Crawford or Adrian Beltre in free agency, which resulted in a disastrous chain of events, including trading slugger Mike Napoli. The impulsiveness of Moreno did not stop there, which explains the $240 million he gave Pujols, and the $125 million he gave Hamilton. These decisions not only have resulted in a terrible performance on the field, as the Halos clubhouse has been very dysfunctional. Miller reported that during a team meeting in August of last season, outfielder Torii Hunter had to be physically retrained from punching Albert Pujols. This followed two bad losses to the Tampa Bay Rays. During the loss on August 17th of that season, Jered Weaver was pitching, and he yelled at one of his infielders for being unable to come up with a ground ball. The next night, when CJ Wilson was on the mound, several players told CBS Sports that they were tired of his chirping in the dugout, including giving advice to hitters. Hunter even told Wilson to “pipe down” and the two exchanged words. Following that game, veteran reliever LaTroy Hawkins called for a players only meeting. However, the players couldn’t even agree on the format of the meeting. Pujols insisted that Scioscia and other management attend the meeting, which other players were against. During the meeting Pujols called out Weaver for yelling at his teammate one night earlier, and also yelled at Hunter for going at it with Wilson. Hunter and Wilson had apparently already made amends, which annoyed Hunter, and prompted a confrontation between Hunter and Pujols. Hunter had to be retrained several times from fighting Pujols at that point. This might also explain why Hunter is no longer and Angel. At this point, it’s become clear: Arte Moreno knows business, and he knows money. He does not know baseball. He needs to leave the baseball decisions to the baseball people. Since he began his first full year as owner in 2004, he has fired 40 people, and sources told CBS Sports that he often maintains “a skeletal front office staff”. Typically when someone is fired, he rarely replaces them, and he’s also reportedly been gouging hours from his low paid employees. Imagine if the Angels still had Kendry Morales, Jean Segura, and Patrick Corbin? This organization would probably look a lot different now, and would be headed in a different direction. The Angels are headed for trouble. They’ve got two really good young players in Mike Trout and Mark Trumbo, but they might not have the money to retain them in a few years. The farm system is depleted, and the team has no pitching. However, if the Halos are going to turn things around, it starts at the top. Regardless of who this teams GM and Manager are moving forward, Arte needs to re-evaluate his own way of doing things. Otherwise, this team is going to have some ugly years ahead of them. This entry was posted in Angels on August 24, 2013 by omzzzzz.